Mediterranean Encounters traces the layered history of Galata—a Mediterranean and Black Sea port—to the Ottoman conquest, and its transformation into a hub of European trade and diplomacy as well as a pluralist society of the early modern period. 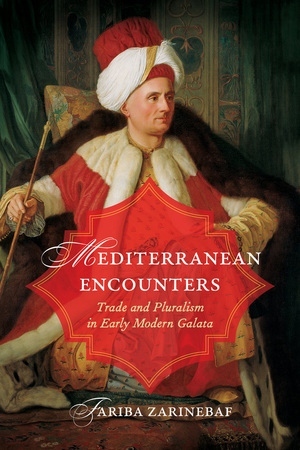 Framing the history of Ottoman-European encounters within the institution of ahdnames (commercial and diplomatic treaties), this thoughtful book offers a critical perspective on the existing scholarship. For too long, the Ottoman empire has been defined as an absolutist military power driven by religious conviction, culturally and politically apart from the rest of Europe, and devoid of a commercial policy. By taking a close look at Galata, Fariba Zarinebaf provides a different approach based on a history of commerce, coexistence, competition, and collaboration through the lens of Ottoman legal records, diplomatic correspondence, and petitions. She shows that this port was just as cosmopolitan and pluralist as any large European port and argues that the Ottoman world was not peripheral to European modernity but very much part of it. Fariba Zarinebaf is Professor of History at the University of California, Riverside. She is the author of Crime and Punishment in Istanbul, 1700–1800 and coauthor with John Bennet and Jack L. Davis of A Historical and Economic Geography of Ottoman Greece: The Southwestern Morea in the 18th Century.